Xofigo is the latest treatment for men with metastatic bone cancer. This treatment isn't intended to be used if mets to organs are present. 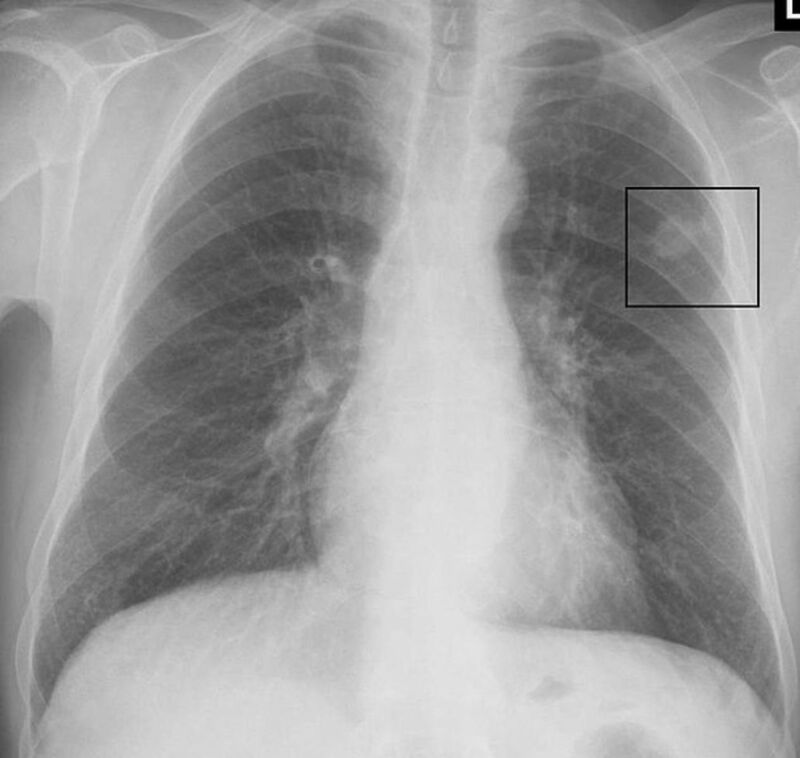 Xofigo, also known as Radium-223, is not recommended if a patient has heart disease, since the drug could cause chest pains. Rad-223, is recommended for men with bone pain, but chances are the bone pain will intensify. So who is Xofigo recommended for? 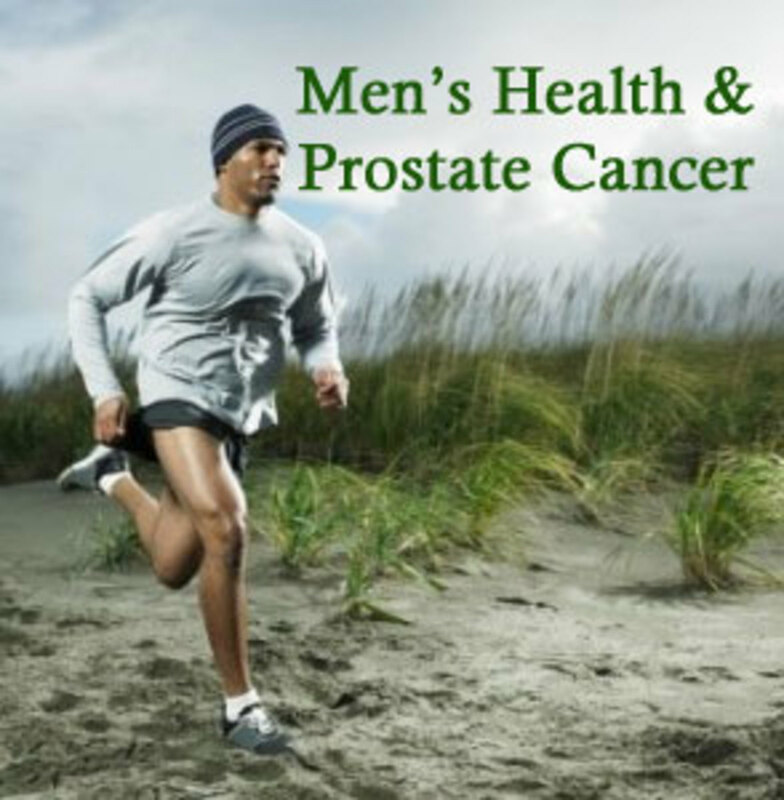 Men with castration-resistant prostate cancer that has spread to the bones, or bone marrow. Xofigo offers them a better quality of life. Always keep in mind that each patient is different. 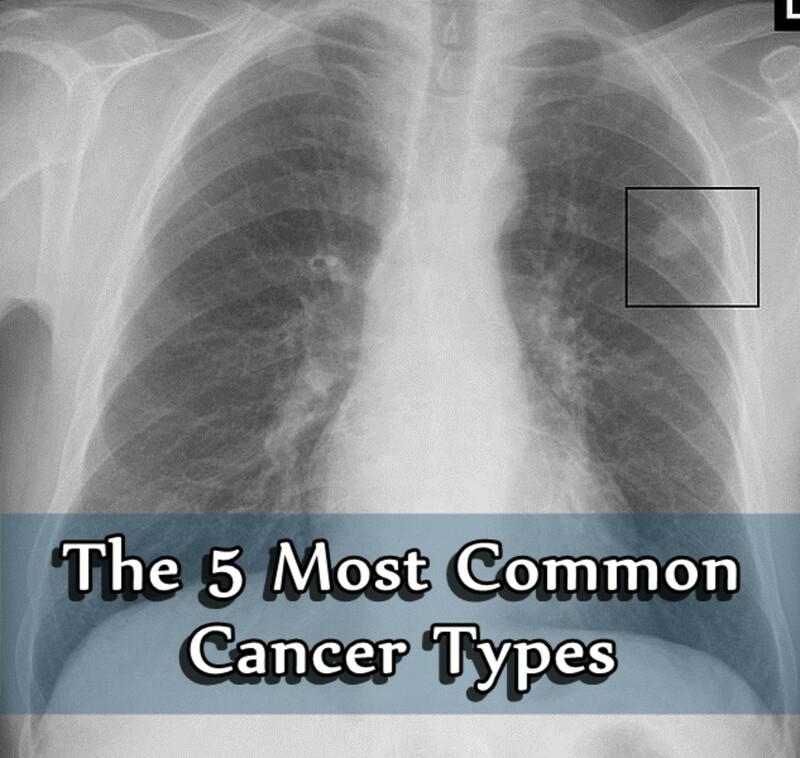 Each cancer is different. Each oncologist has their treatment plans. What treatment works for one, might not work for another. Prostate Cancer is a very sneaky disease and tricky to figure out. We all hope that one day a genius somewhere will figure out this dreadful disease and hopefully discover a cure. Who am I? I'm not a physician. I am a wife and caregiver. I am a cancer advocate. I'm a hands on learner. I prefer to hear real life journeys told to me by some one who has walked the walk, instead of just using Google for information. I do not believe that we should just accept recommendations for treatments from our doctors without doing our own research and asking a LOT of questions. My final question is always..."Can you now tell me what I forgot to ask you?" You'll be surprised at some of the responses you will receive. 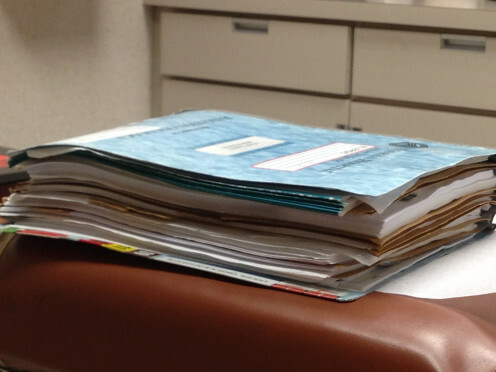 Before, during and often after each treatment I collect information from the doctors, nurses and other specialists who have experience with the specific treatment at the time. This article is based on information that was passed on to me for Xofigo. In return, I am passing it on to you. Since 2008, when my husband Dave was diagnosed with Prostate Cancer, he has been on many treatments. Our cancer journey includes...Eligard, Casadex, Provenge, Zytiga, Taxotere, Xtandi, Lupron, Jevtana, Carbo/Taxol, DES and now Xofigo (along with Lupron and DES.) Some treatments worked for a while, some not so much, some are still working. We now proceed to our next chapter, Xofigo. Just like all treatments, doctors continue to learn, as do we. Xofigo was just approved last year and used mostly as a pacifier for men in late stages. Their plan didn't work out too well. 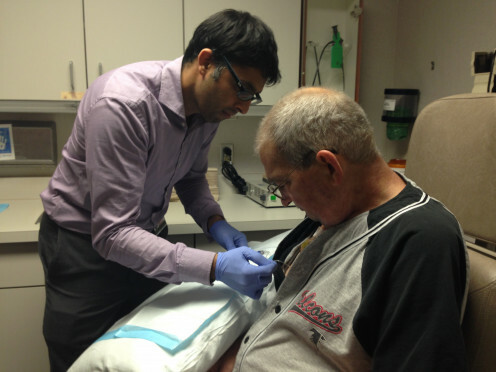 Those men were in severe pain, Xofigo enhanced their pain. Very sad way to go. Oncologists are now recommending Xofigo sooner. It's best for men with none or minor bone pain, but also have bone marrow infiltration. Dave had his bone mets radiated through out the years, he doesn't have bone pain. His issue is bone marrow. But Xofigo does nothing for organ or lymphatic mets, so while being treated for bones mets, other areas are still vulnerable. It's mandatory that platelets be over 100 before Xofigo treatment can begin. This treatment will effect your platelets, so the higher they are, the better. After the initial treatment, platelets must be over 50 to continue on. A platelet infusion can be done if needed. There are supposedly no restrictions for hemoglobin, but blood transfusions are a possibility, so don't be alarmed if one is suggested. If your platelets are too low to begin Xofigo, there is another option. Quadramet. There is one stipulation. With Quadramet, there is a wide window before a patient could begin chemo again. With Xofigo, there is very little or possibly no window at all. So if you might need to go back to chemo, Xofigo is the way to go. Cost is another issue for many. Quadramet is about $4,000, while Xofigo is close to $70,000. On the flip side, Quadramet is only one injection, while Xofigo is 6 injections, one every 4 weeks. Blood work is required in between each visit. The Xofigo regimen is for 6 injections, but this all depends on the outcome of the lab work. If the blood work isn't up to par, treatment could be stopped or temporarily suspended. Also, PSA shouldn't be tested right away since the treatment could give a false reading. Your doctor will give you the best advice for PSA tests. A few days, some times a week, before your injection, your weight will be needed. Xofigo's dosage is based on actual weight. To the ounce. Your weight must be documented by a nurse. August 28th was Dave's first injection. The visit went quicker than we thought. It went very smoothly. The nurse was pleased to know that Dave had a chemo port. 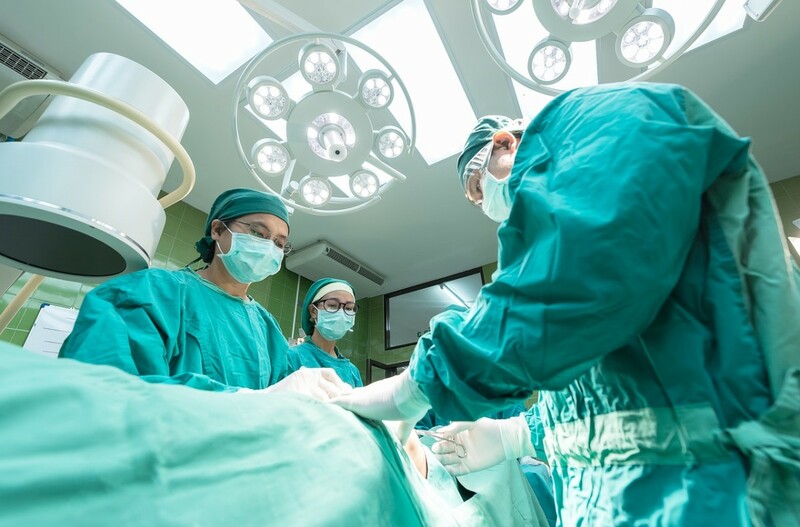 Using a vein, of course is an option, but an accessible, functioning port is preferred by some nurses. Are you aware that drinking water helps plump up the veins for easier needle insertion? If not, you are now. Actual administering of the Xofigo injection took less than 3 minutes. It was the fastest treatment Dave has ever had. Now is when the work begins, to avoid contamination of the radiation. The radioisotope is hard at work to find the cancerous cells. The remaining amount that's not needed gets excreted via bodily fluids. Stool, urine and sweat. Small amounts are excreted just from touch. The first 7 days are the most active for excretion. With days 1 and 2 being the heaviest and less excretion until day 7. During this first week after treatment it's very important to be cautious. Exercise is beneficial. No matter how limited you are to moving, just do your best. Be careful not to injure yourself and cause bleeding. Low platelets have a difficult time forming clots to stop the bleed. Eat healthy meals. Avoid processed foods. Enjoy plenty of fruits and vegetables. Greens, kiwis, oranges and tomatoes can help boost the count. Avoid alcohol and caffeine. They could slow down the production of platelets via the bone marrow. Omega-3 foods will naturally boost your immune system and may help boost your platelets. Stay hydrated. Drink plenty of water. 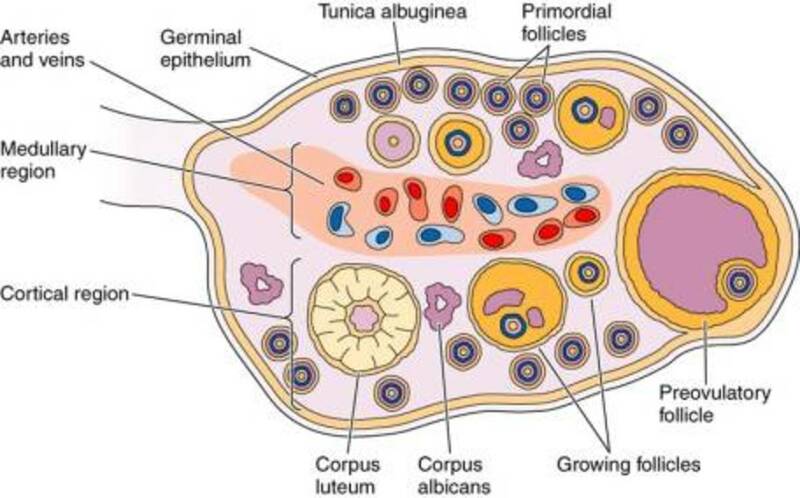 Blood cells are made of water and protein. The more water you drink, the more blood cells your body will produce. You could also eat foods that have a high water content...watermelon, cucumbers, lettuce and strawberries all top the list. Get plenty of sleep. At least 7-8 hours a night. Take naps when possible. Vitamin C is also helpful. These tips might be a bit extreme, but it's always better to be safe, than sorry. There is no need to be anxious, just cautious. My intent is not to make you panic. These are just suggestions that you might find beneficial for your Xofigo journey. Flush the toilet twice. Three times if needed. Add a few drops of bleach afterwards to disinfect. Use Lysol wipes to clean up areas that the patient has used. Such as countertops, door handles...etc. Use your elbow or knuckles to flip light switches. Wash the patients clothes separately. Use plastic dinnerware to avoid saliva contamination. Use bottled water, again for saliva. Designate hand towels for patients use only or use paper towels. No close contact with children under 18 years old. Their cells are still developing and the less exposure to radiation, the better for them. Adults will get some contamination, but it's miniscule and will not effect adults as much as kids. Radiation can not be inhaled. Don't store toothbrushes in the same cup or holder. Also if you normally share a dental water pic, buy your own or sanitize it before each use. Use hand sanitizer when soap and water is not available to avoid spread of radioactivity. After day 7, relax. Enjoy the break for 3 more weeks and the next injection is due. During treatment you must stay well hydrated. Drink lots of water to help flush the radioactive material out of your body. Also remember that drinking water helps produce blood cells. Water consumption is crucial all the time, but more during this treatment. I have heard many success stories regarding Xofigo. Then again, I have heard stories that weren't as successful. I wish you the best with your journey. I will be updated this article as Dave's Xofigo treatment continues. I will keep you posted on side effects and progress. As of August 31st...Dave is doing well. No side effects. Sept 2. 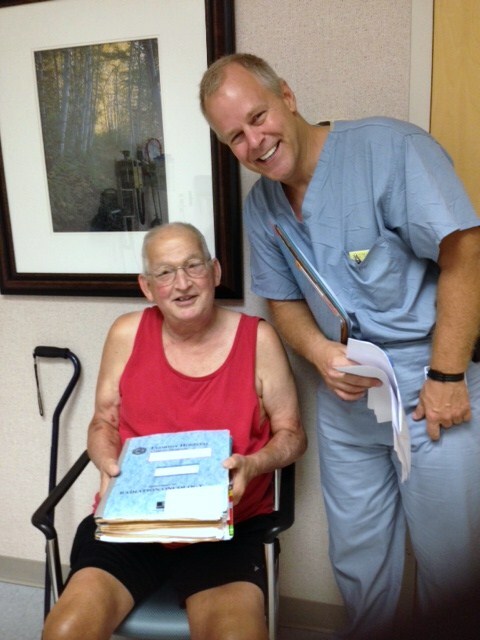 Even though it's only been 5 days since Xofigo we are happy to report that Dave's CBC was perfect today. Hgb is 10.4 and Platelets are 95. Sept 8. Hgb is 10.9 and Platelets are 99. Holding steady! Sept. 25th ... Xofigo #2. Labs are doing well. Today I spoke with the Radition Physicist who spoke with Bayer about when Xofigo will resume...their reply was, "we have no idea!" Wow...we are talking about a multi-billion dollar company! Well hopefully they will be producing and shipping the product soon. Xofigo is back in action! November 3rd ... I heard from the Oncologist and Radiation Physicist and it's a GO for injection #3 of Xofigo! Great news! Appointment is set for November 6th at 10am. I also heard that a study was performed on the top ten isotope therapies, and Xofigo came in number one as the most efficient for treating metastatic to the bone prostate cancer. More great news! We will also be meeting the new Radiation Oncologist, Dr Rau. I heard he was very nice and young. All I care about is how qualified he is for his new job. Time will tell. 11-6 Today was Xofigo #3. All went smoothly. We met the new Radiation Oncologist. He came from Moffitt Cancer Institute in Tampa where he administered Xofigo many times, but not via a chemo port. The process was a bit tricky, but he learned quickly. I found out that at this time Xofigo is not accepting new patients until their present patients are all caught up., which is hopefully soon. 12-4 The Xofigo injection went very smoothly today. No hiccups at all. Dave's labs are doing well. Except for his PSA which is now 400, up from 334 last month. His weight is steady. As Dr. Rau said, it's all about how you feel and Dave feels good! We are having CT Scans performed next week. Next injection is set for December 31st, what a way to ring in the New Year. 12-31 Xofigo #5 is complete. Went smoothly. Still not sure how well this treatment is working. PSA has rose from 400 last month to 1214. Mets to liver is most likely the culprit. I am not surprised since Dave's organs and soft tissue were not being treated while on Xofigo. Just his bones which were not really the issue. Dave is fatigued. He will not have the 6th Xofigo treatment. He will begin chemo on January 19th. There is a 3 week wait to start chemo again after the last Xofigo injection or else his bone marrow could be depleted. Oh well, Xofigo was an interesting ride, but I feel it was a waste of time and money for us. I wish others the best of luck with the treatment. I will update this article once Dave has his Post-Xofigo Bone Scan to see how successful Xofigo was for him. 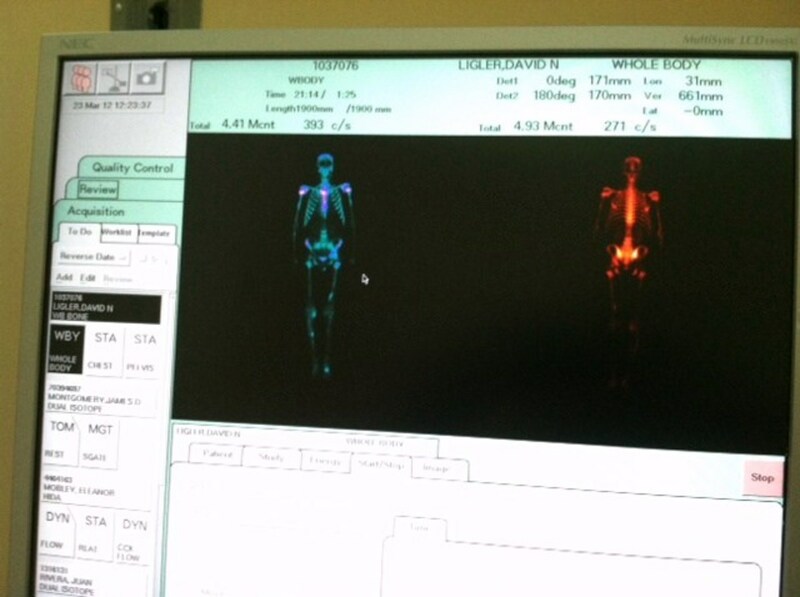 6.5.15 Update...Dave has opted out of another bone scan as of this time. His oncologist supports his decision. Together they agree that Xofigo did not work for Dave due to his advanced Prostate Cancer. Dave entered hospice on June 29 and bravely passed away on July 6, 2015. Due to metastasis to his liver his body couldn't fight the fight anymore. Dave is a hero to many. 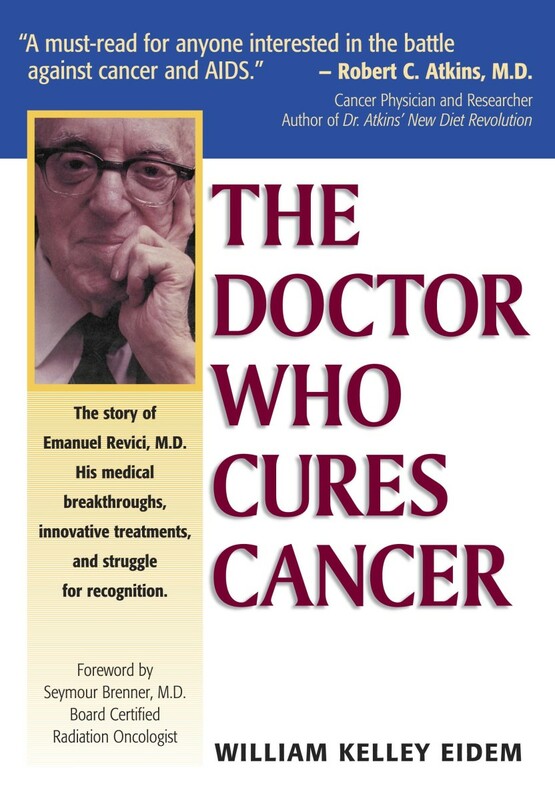 He taught so many other men and physicians along his journey. Have you used the Xofigo Treatment? Yes. Treatment was a success. No. I'm about to begin the Xofigo journey. Yes. I, or some one I cared for didn't have a successful treatment. I opted out of Xofigo and used Quadramet. 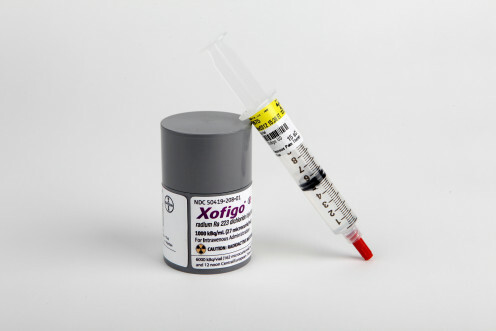 Learn about Xofigo (radium Ra 223 dichloride) Injection, a treatment option for patients. Discover how it works, its safety & prescribing information. If you are a member of the Facebook community and are searching for a support group, search no longer...I started "Cancer Teamwork" on a whim and now have close to 500 members, chances are you will find the support you need. Fighters, survivors, caregivers or cheerleaders are always welcome. Wishing you the best with your treatment, Mcrchap! Thank you Sunshine625 and Dave for sharing the detail accounts of the xofigo journey. I am the care giver and my husband just had his third treatment with xofigo. He is extremely fatigued for the 3rd day in a row and appetite is not the greatest. He is eating homemade soup and drinking water and Boost. I think I need to report the fatigue because it is excessive. Very concerned right now. I pray for each and everyone of you who are going through as the care giver and the patient. This is a heavy road. Sorry to hear about Steve, I wish him the best! I heard today that Xofigo is a no-go for the rest of the month...Hopefully the product will be available in November. Studies show that men could take a 8 week break in between injections, 10/23 will be 4 weeks for Dave...the countdown begins. Thanks, Will. I just sent this to a very dear friend I've known since high school. Her son has this same cancer and he will be getting the drug as soon as it's available. His name is Steve, and we'll be praying for him and for your husband. BTW, my friend's name is also Linda. Thank you WillStarr! I wish you continued success! Dave's older brother also had the radiation seeds a year before Dave was diagnosed. Last we heard, he was doing well. Dave's younger brother was diagnosed the following year. He had surgery. He's doing well. I had radiation seed implants 17 years ago for prostate cancer, so I'm really pulling for your husband, Linda. Thanks Y'all for your supportive words...our Xofigo journey is another learning lesson for us. Great post, Linda, with good information even for people dealing with other types of cancer. For example, my mom tolerates chemo well except for the needle insertion. I am going to share your tip about drinking water. Best wishes to you and Dave on this latest chapter of your journey. I got a good chuckle out of Dave's reaction to the ice bucket challenge. Your sharing from experience is such a great way to encourage others on this procedure. Bless you and your family as you journey together. I do hope the use of this drug will be a success story. Thank you for putting this information out there to help others. They can learn much here. Hello Sunshine625 Thank you kindly for following me. Have a good weekend. This will be very helpful information for many others, Linda. It's very kind of you to share your journey. How sobering to read about the health precautions regarding Lysol wipes, bottled water, etc. Another wonderful Hubber, ologsinquito, has written about chemotherapy's potential impact upon others within the household, and you provide an excellent example. My heart is with you and your husband as you courageously face this challenge. I am constantly amazed by your courage and ever-growing knowledge. 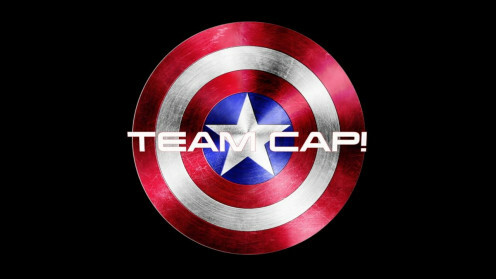 You and Cap are simply amazing! Ice bucket challenge? I mean this sman is super. Linda, your hubs about cancer are so precious, and I believe thousands of readers are and will forever be grateful for all the information they get from you. Dave is a hero, I so admire his positive spirit. Of course, behind every man is a woman, and you are the best. Hugs to you all from South Africa. "Sue has read about Xofigo and is no longer apprehensive about the treatment for her Dave. " That's it, Linda. I can see others reading your words and feeling the way Sue does. You write with precision, accuracy and with an understandable, compassionate style. SEE what amazing "good" you do? Thank you all for your comments, support and love! You most likely know by now how much we appreciate y'all. This article was inspired by a woman in Ontario who read about our journey and reached out to me. Our husband's, both named Dave, are on a similar PCa journey. Sue has read about Xofigo and is no longer apprehensive about the treatment for her Dave. Amen. You're a doll to research and write about this. No doubt you will help lots of people out there looking for help and answers. Great job! You have a real talent for taking complicated information and putting it in terms most people can understand, plus you thoroughly research your topics. This is an excellent article showing pros, cons and precautions. Hope Dave's treatment goes well. He is lucky to have such an informed and loving wife to help him through. Thanks for sharing your journey with the rest of the world. I have a cousin who is battling prostate cancer. There are so many people searching for useful information. This will help a great deal. I count my blessings every day because the big C has gone around my family, but I have had good friends who have suffered through it. I have always admired you for all you do, and for the love and support you give your husband. I will continue to follow his treatment and please know: I wish him the very best. This is so detailed, informative and written so anyone can understand...as I was reading, I was thinking what a wonderful pamphlet this would make as folks were trying to make informed decisions at stressful times, perhaps after having had a conversation with an md that was hard to follow. I love Dave's video -what an example of the strength he shows on a daily basis, with you right by his side on this journey. Like effer, I feel proud to know you both and very inspired. Voted UP and UABI...sharing in the hopes that others will as well. Yet, the world is blessed to have individuals like you and Dave who stand as clear examples of strength, hope and generosity in the face of all of the negative. You are the real "Dynamic Duo".....heroes for the everyday person, susceptible to any and all blows to the gut that may occur . You keep going like energizer bunnies, continue to live every day with a smile & as if that were not enough.....You bring what you learn to the public and share your experiences, ups and downs with words of encouragement. You often share important information and told from personal experiences. Take care! Thank you, Bill. No matter how painful our journey is, I can't fathom not helping others along the way, with their journey. I feel the need to make some noise along the way. Your support is always appreciated. Excellent information, Linda. I love how you share this painful journey with all of your online friends. Very important that writers do this as a service to others. Blessings to you and yours.